With local money in place, when will Columbus, D.C. kick in for a new Western Hills Viaduct? CINCINNATI — It was a little more than a year ago when Mayor John Cranley stood beneath the aging Western Hills Viaduct -- cracked concrete and all -- and announced the city's $33 million commitment to replacing the 86-year-old bridge connecting Downtown and Cincinnati's West Side neighborhoods. "It has to get built. It will get built," Cranley told reporters at the Dec. 13, 2017 news conference. His announcement came within days of a similar announcement from the Hamilton County Board of Commissioners, which made its own $33 million pledge toward replacing the bridge. Despite finding those local funding sources, though, convincing lawmakers in Columbus and Washington, D.C. has remained a challenge. According to a recent memo from City Manager Patrick Duhaney, the city's Department of Transportation and Engineering received word that it would not receive $25.6 million in grants requested from the state and federal departments of transportation. Duhaney wrote the state acknowledged the importance of the viaduct replacement and "has encouraged the city to reapply for funds in the next solicitation cycle," Duhaney wrote, but went on to explain the outlook for federal funding under the Trump administration, on the other hand, remains "uncertain at this time." The $25.6 million in money sent to projects other than the Western Hills Viaduct are just the latest in a string of grant proposals -- requesting money for the bridge -- that state and federal officials have rejected. Since the spring of 2010, city and county officials have requested more than $300 million in state and federal grants among 14 different grant applications. To date, the project has received roughly $24 million in state and federal funding, a return of less than 8 percent of what was requested. That $24 million does not include slightly more than $6 million in additional local funds used to match those grants. Historically, major transportation projects like the viaduct are financed with 20 percent of the cost coming from local sources and 80 percent coming from the state and federal governments. "Columbus and Washington talk a big game, but they do nothing," Cranley told WCPO. "President Trump had a press conference in front of the Brent Spence Bridge. Governor candidates talked about putting more money into infrastructure, and now we have yet to see if the proof is in the pudding, and if they're going to follow through on their promises." From Cranley's vantage point at City Hall, the record of rejected grant requests is an example of the state and federal governments not returning the city and county's investments. "We send more money in taxes to D.C. and Columbus than we get in return," he said. "We're not asking for charity. This is vital infrastructure that needs to be fixed, so we should get a small portion of what we send to them to fix a vital bridge." By Hamilton County Commissioner Todd Portune's count, the local funding toward the project actually amounts closer to $100 million, "which is a rather significant sum," he said. "To put that into perspective, the Jeremiah Morrow Bridge on I-71 north of Kings Island -- we've raised more money than it cost to build that bridge," Portune said. The Jeremiah Morrow Bridge spans the Little Miami River Valley between Fort Ancient and Oregonia, Ohio. The six-year, $88.1 million replacement project wrapped up in November 2016, and crews demolished its older counterpart about six months later. 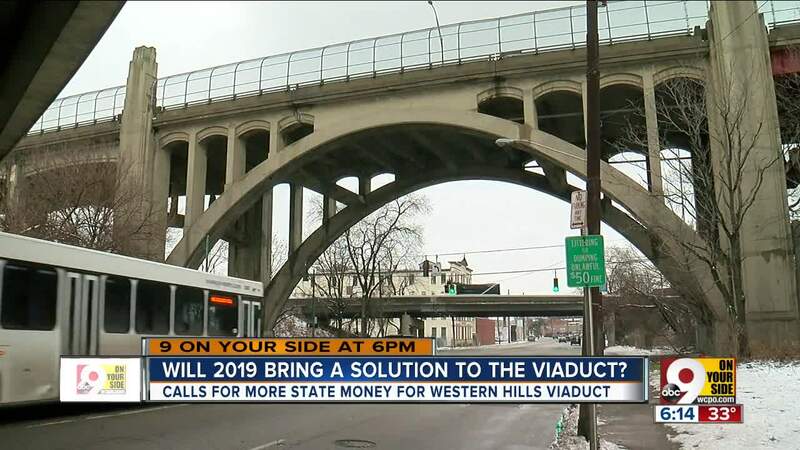 The $100 million-plus raised for the Western Hills Viaduct also becomes a "significant sum," Portune said, when considering ways he hopes city and county engineers might reduce the cost down from the most recent $335 million estimates. Chiefly, Portune hopes the city and county can strike a deal with Duke Energy over a substation sitting in the right-of-way where a new bridge would span. Portune hopes that arrangement could reduce the cost of building a new bridge by as much as $40 million. But when it comes to getting more attention from officials in Columbus and Washington, Portune said future grant applications need to tell a different story, one that positions the bridge -- primarily thought of in terms of the 55,000 city commuters that use it each day -- within a larger context. "How does (replacing the bridge) help us from the standpoint of the global economy?" Portune asked. "It does because we are within 70 percent of all the goods or manufactured products that come into North America. Their final destination point -- 70 percent of them -- is within one day's drive of Cincinnati." For Portune, the Western Hills Viaduct is not just a commuter bridge, but is one part of the larger Brent Spence Corridor with implications for the movement of freight by road, train and barge together. He said he hopes a new bridge will also mean the opportunity for more freight line capacity to run through the Queensgate railyard, over which the new bridge would span. "That helps to tell the story of the Western Hills Viaduct as to why state and federal funding for it is so important, because it's tied directly into the completion of the Brent Spence Bridge project," he said. Officials estimate the Brent Spence corridor -- stretching along Interstate 75 from the Dixie Highway interchange in Northern Kentucky to the Western Hills Viaduct -- alone carries anywhere from 3 to 5 percent of the nation's gross domestic product each year. Portune said he is forming a task force to study successful bridge project applications and strategize for future requests. "We're not just Cincinnati, and we've got to understand that, and that's part of the story that needs to be told in a re-do in our approach to these grant applications," he said.